"Bipartisan" and "McKinley" in the same sentence? Today’s Mike Myer column is mostly about praising WV’s 1st Congressional District congressman, David McKinley, for his supposed bipartisanship. Support for Myer’s position comes in the form of the recently-released Lugar Center Bipartisan Center Index for the 115th Congress which ranked McKinley 11th in the House. The Index purports . . .
A few weeks ago, . . .
Has O’Rouke won the Democratic nomination? (Did I fall asleep for 18 months?) And what happened to Ocasio-Cortez? (I thought that Ogden papers were required to run an attack on her and her ideas every day.) Wow! 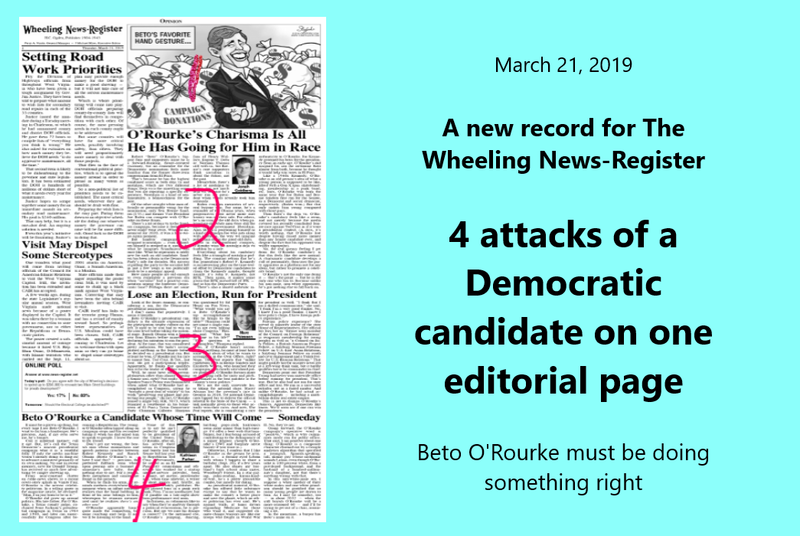 Even Hillary Clinton back in 2016 was never attacked four times on one editorial page. There is not much . . .
U.S. Sen. Joe Manchin is the only Democratic senator who did not co-sponsor an LGBT anti-discrimination bill. The Register-Herald reports 44 Democratic U.S. senators and the two independent senators that caucus with them have signed onto Senate bill 788. The bill sponsored by U.S. Sen. Jeff . . .
Well, at least they’ve dropped the façade that they are in the news business: while it’s still over two months away, the Ogden Newspaper-sponsored “Tough as Nails Urban Challenge” needs promoting and what better way to do it than devote most of your first two “news” pages to it. A large picture, a large graphic, and a detailed map supplement . . . If you review some of the smaller-sized papers found at Newseum you’ll get similar results. Today, the most important story for most U.S. newspapers was the shootings at the mosques in New Zealand. What about the Wheeling Intelligencer? Readers can find an AP story about worldwide reaction to the shooting halfway down the “ . . . Unfortunately, the president has decided to once again circumvent Congress and govern by executive overreach.